With temperatures reaching into the triple digits, the risk of heat-related injuries and illnesses increases. It’s important to make sure you and your family are taken care of in this sweltering weather! 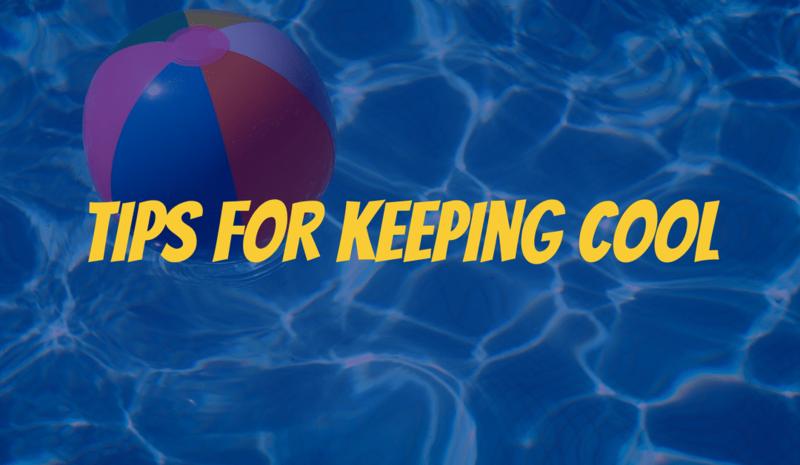 We’ve compiled a list of tips that should be able to help you keep cool this summer! 1. Wear light-colored and loose-fitting clothing. Loose, breathable, lightweight and light-colored clothing will help keep you as cool as possible. Clothing made from cotton typically breathes better than synthetic fabrics. 2. Limit all outdoor activity. Try to limit outdoor activities if possible. If you have to be outdoors, get outside early in the morning or in the evening, or try to seek shade. It’s still hot in the shade, but it is cooler than being out in the sun. This is a given, you always hear people telling you to stay hydrated during the summer, but that’s because it is very important! When the weather heats up, you’ll need to increase the amount of water you drink. Don’t wait until you’re thirsty, especially if you’re outside in the heat. Instead, make sure to drink water before, during, and after your time outside. Heat-related illness is a serious danger, and drinking water will keep you cooler and well hydrated. Regularly drinking water assists your body in better regulating its core temperature. 4. Don’t wipe your sweat away. When it’s allowed to evaporate, sweat can cool your body. If you sweat while you’re outside, you may be tempted to wipe it off, but it’s best to let it evaporate on its own. You can jump-start the process by giving yourself a quick mist of water from a spray bottle before heading outside. 5. Hit the pool or a water park! If you have your own pool, that’s great! If not – find a community pool, or you can visit a nearby water park. See a list of DFW water parks here. Swimming or playing in water is a great way to keep cool this summer. You might as well have fun while keeping cool, right? 6. Check your car before you get out. This is important if you have young children or pets that ride in your vehicle. Hot car deaths are a very sad reality in the summertime, but they are preventable. Check your vehicle before you get out! The Centers for Disease Control say that it is never safe to leave children (or pets) unattended in a car in any weather, even with the window cracked open. Also, remember to check on elderly loved ones and neighbors who are vulnerable to heat-related illnesses and may not be aware of how hot it is in their homes. If your AC goes out, give us a call right away! At Reliant Air Conditioning, we can help you solve your air conditioner problems with the most professional AC repair and replacement you’ll find in the DFW Metroplex. If you’re in need of a heating and air conditioning company who cares about its customers like you’re one of our own, contact us today!